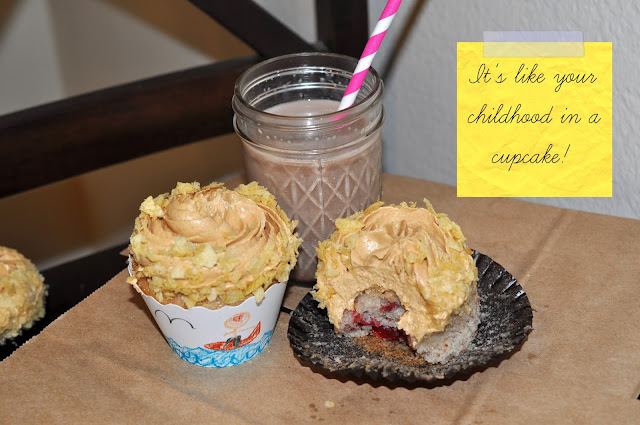 The Cupcake Activist: "It's like your childhood in a cupcake!" "It's like your childhood in a cupcake!" Who am I kidding? I still eat PB&Js all the time! I never tire of them. So when I saw this recipe from Chronicles of a Foodie, I shouted for joy! These Peanut Butter & Jelly cupcakes are made with a yellow cake mix, powdered freeze-dried strawberries, strawberry pie filling, and of course peanut butter. Yummy!